By Blacklock - mare by Phantom. King Fergus Sire Line Quick Chart. Voltaire was a lightly-raced winner of the Doncaster Cup. In the stud he got two classic winners, one of which, Voltigeur, continued and augmented the sire line by siring winners of top staying races in England and France. Through Voltigeur, he was tail-male ancestor of St. Simon, the most influential stallion of the late 19th and early 20th centuries. His sire, Blacklock, was a great stayer with a huge stride. He had a deep shoulder and girth, and a muscular neck, vertical pasterns, and an unattractive head with a Roman nose, all traits which he passed on to many of his offspring. His sire, Whitelock, was a fair stayer and winner of four and two mile heats, but had an indifferent race record and was used as a country stallion after he was retired from the turf. Blacklock's dam, a mare by Coriander, had been purchased for £3 by Francis Moss at the York horse market, and her foal, Blacklock, was sold to a Yorkshire horse dealer, Thomas Kirby, for £40 when a yearling, who sold him at age two to Richard Watt of Bishop Burton, near Beverley, Yorkshire. 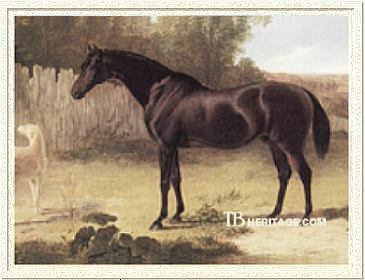 Blacklock's dam later produced the St. Leger winner Theodore (1819). Blacklock ran until the age of five, winning the York Cup, the four-mile Great Subscription Purse at York twice, and some other races in the north, and was retired to stud in Watt's ownership, standing at various public stables at at Bishop Burton throughout his stud career, dying fairly early at the age of 17. 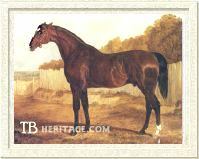 He was a successful stallion, siring over seventy winners of 442 races, and was leading sire in England in 1829. Voltaire continued the sire line; another son, Velocipede, sired three classic winners, and Lollypop, his daughter, produced Sweetmeat, a key sire in the Byerley Turk sire line. Voltaire was bred by Robert Stephenson of Hart, Hartlepool, who later bred his dual-classic winning son, Voltigeur. Voltaire's dam was a mare by Phantom, and Voltaire was by far her best of fifteen live foals. He was a big horse, and his head was more refined than that of his sire's and most of other of Blacklock's offspring. He only spent two years on the turf before retiring to the stud, where he got two classic-winning sons, one of which, Voltigeur, carried on the sire line. Running for his breeder, Voltaire raced twice at the age of two, winning both Catterick's Richmond Club Stakes and Newcastle's Tyro Stakes. He was sold after this season to the vastly wealthy William Harry Vane, who had been recently elevated from Earl of Darlington to (1st) Duke of Cleveland. His seat and stud were at Raby Castle along the Yorkshire-Durham border. The Duke was an enthusiastic sportsman who hunted his large tracts of land with what became the famous Raby Pack. After the turn of the century, he became increasingly involved in race horse ownership and the associated thrills of placing huge wagers on his animals, purchasing thousands of pounds worth of horses to run and later place (sometimes briefly) in his stud, including Trustee, Liverpool, Barefoot, Memnon, and Muley Moloch. Vane won the St. Leger with the Lottery son, Chorister, in 1831. For Lord Cleveland Voltaire began his second -- and last -- season, 1829, by winning the Shorts, a mile sweepstakes at York spring meeting, beating five other horses. He ran second to Rowton in his next race, the Doncaster St. Leger, beating a very good field of seventeen other horses, lying in wait through most of the race before making his move, but unable to head Rowton, who beat him by half a length. In this race, many felt Voltaire's jockey, Sam Chifney, had waited too long to call on Voltaire, who gave an amazing effort to cover the distance to the leader. His next, and last, race was the Doncaster Cup, which he won, beating Blacklock's son Laurel (age five), the great mare Fleur-de-Lis, and three others. In the stud Voltaire got two really good sons on the turf, CHARLES XII (out of Wagtail, by Prime Minister), who won the St. Leger in 1839, and VOLTIGEUR (1847, out of Martha Lynn by Mulatto), winner of both the Derby and the St. Leger, and the son who continued the sire line. Voltaire's sons HARPURLEY (1835) won the Bretby Cup at Burton-on-Tees in 1839; YORKSHIRE LAD, won the July Stakes, but died soon thereafter; and JACK SHEPPARD (1838) was a good northern runner who won stakes at York and Stockton, both times beating the great Alice Hawthorn. Other sons who later became decent sires were PICAROON (1835, out of Walton daughter Handmaiden), who got several good fillies on the turf, and moderate racehorse BARNTON (1844), a brother to Voltigeur, who sired the great Cup horse, Fandango, the only horse to win the Stockbridge, Ascot and Doncaster Cups in one season. CHARLES XII was a brown colt bred in 1836 by Major Nicholas Yarburgh. He was out of the Prime Minister mare Wagtail, whom the Major had also bred at Heslington Hall, near York; she also produced the Blacklock son Laurel who was a great cup winner in the north, and Laurel's sister, Belinda, second in the Doncaster St. Leger and later a good broodmare at Heslington, second dam of Sweetmeat. Charles XII was a weedy and somewhat delicate youngster who reached 16 hands by the age of three, but he proved to be a game stayer who ran for five seasons. He won what was apparently his first race, at age three, the Liverpool Cup, beating some good horses, such as Epirus and Lanercost. His next race that year was the Doncaster St. Leger, where he dead-heated with Euclid, beating twelve other horses, including Derby winner Bloomsbury; the was the first ever dead-heat for the St. Leger. CHARLES XII won the run-off by a neck. His last race of this season, two days after the St. Leger, was the Doncaster Cup, where he beat Lanercost and the great racemare Bee's Wing. Yarburgh sold Charles XII after this season to Andrew Johnstone, a native of Dumfriesshire, Scotland, who was a partner in the firm of Jardine, Matheson & Co., a trading company that did business in China and India. Johnstone had been in India and the far east for a number of years, and returned home in 1839 with a fortune and a yearning for a good racehorse to spend it on. He commissioned the innovative trainer Tom Dawson, then at Brecongill stable at Middleham, Yorkshire, to buy him a horse for £3,000; Dawson advised him he could purchase two good horses at that price, and initially proposed he purchase Hetman Platoff and The Provost, neither of which were of sufficient quality for Johnstone. An offer was made on Euclid for £2,000, which his owner, Mr. Thornhill, turned down. Finally, a deal was struck with Yarburgh for Charles XII for £3,000, and Johnstone had the pleasure of running the horse for the remainder of his years on the turf. Upon hearing of her son's purchase of CHARLES XII, Mrs. Johnstone purportedly exclaimed "I cannot think what Providence was doing to allow me to give birth to a son who is sae daft as to pay all that money for a racehorse." In 1840, his first season owned by Johnstone, he won only one race, the Grosvenor Stakes at Liverpool, beating the three year old and more lightly weighted Maroon. At that same meeting he ran third for the Liverpool Cup to Sleight of Hand. Moving on to Goodwood, he didn't place in the Cup there, won by Zinganee's son Beggerman, with Lanercost and Hetman Platoff (the horse rejected by Johnstone) second and third. He ran third to Bee's Wing and The Provost (another horse rejected by Johnstone) in the Doncaster Cup. His season ended with a loss to Lanercost in the Dumfries Cup. The next year, 1841, age 5, was more successful. He won the Cup at Catterick Bridge, and then the Craven Stakes at Newcastle, beating Bee's Wing and two others. He failed to place in the Liverpool Cup again, then went on to Goodwood, where he won the Goodwood Cup, beating nine other horses. At Wolverhampton he won the Cup, beating a top handicap horse, Isaac, by Figaro. He also won a £80 race at Stirling, and the Cup at Kelso that year, and took four walk-overs--at Stirling for the Queen's Plate, at Stirling for £80 and the Whip, at Edingburgh for the Queen's Plate, and at Dumfries for the Cup. At age six his best wins were a 1,000 sovereign match against Hyllus (by Sir Hercules) at Goodwood, and a few days later a win of the Goodwood Cup for the second time, beating eight other horses. That year he also won the Challenge Whip and 65 sovereigns at Perth, and the Gold Cup at Dumfries, both times beating only one other horse, the Voltaire son FOXBERRY. His other races included second place to Bee's Wing, by four lengths, in the 2 mile Newcastle Cup; second to Bee's Wing by five lengths in the Doncaster Cup, beating two others; second to Cabrera in the Kelso Cup, in which three horses ran. He did not place in Doncaster's Great Yorkshire Handicap, won by the three year old Galanthus in a field of twelve, and he was also beaten in a £150 race at Doncaster by the three year old colt Whistle-Binkie. At age seven he did not place in his first outing, the Queen's Plate at Ascot. Moved on to Newcastle, he won the Craven Stakes there, but did not place in the Newcastle Cup race. At his favorite course, Goodwood, he was unable to place in the Cup, won by his old nemsis Hyllus. He was then taken to Doncaster, where he ran second to the great Alice Hawthorn, then age five, in the Doncaster Cup, his last race. In 1841-42 Johnstone purchased Sheffield Lane Paddocks near Ecclesfield from Tom Booth, and bought a number of Booth's broodmares as well, including Rebecca, the dam of Alice Hawthorn, who, for Johnstone, produced Rowena (by Recovery), Annandale (second in the Derby, by Touchstone), and Fair Helen (by Pantaloon; her son Lord of the Isles, also bred at Sheffield, won the 2,000 Guineas). He built a spacious and airy stallion box there especially for CHARLES XII, who apparently had pride of place in his new stud, for a while. CHARLES XII began his career there at an advertised fee of 12 guineas. Because Johnstone lived primarily at his home in Dumfriesshire, his stud was managed by Robert Wilson. Johnstone sent his yearlings to the Doncaster sales, including those by CHARLES XII, where at first they sold well, but none were immediately successful on the turf, and CHARLES XII was unsuccessfully offered for sale. Eventually he was leased to Richard Tattersall, who placed him at stud at Willesden Paddocks. He was destroyed on October 12, 1859, age 23, and he was buried in an old quarry near Sheffield Paddocks, but he had long been supplanted as principal sire at Sheffield by such horses as Annandale, Fazzoletto (winner of the 2,000 Guineas), Warlock (Great Ebor Handicap, Doncaster St. Leger, Great Yorkshire Handicap). After Johnstone died, his brother, John Johnstone, took over the stud; he won the Derby with Pretender (by Adventurer, a stallion at Sheffield Paddocks, purchased by John Johnstone in 1865) in 1869, and was long-associated on the turf with his cousin, (Sir) Robert Jardine. Of CHARLES XII's progeny, his most successful racehorse was the gelded Little Charley (1848), who won the Grand National Steeplechase at Aintree in its snowy, slushy running of 1858, after four previous attempts. 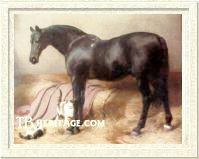 Another Charles XII son, Fire Eater, sired the 1866 Grand National Steeplechase winner Salamander (1859). A daughter, Olga, from the Rebecca daughter Fair Helen (Family 4-e) produced several daughters at Sheffield Paddocks who bred on; one was Performer (by Adventurer), whose son Teviotdale, won the Ascot Stakes twice, and the 1911 Grand National Steeplechase winner Glenside descends from Performer. The French stallion La Farina (1911) also descended tail-female from Olga. Voltigeur. Used with permission of the Marquess of Zetland. VOLTIGEUR was born in 1847, bred by Robert Stephenson, who also bred his sire. His dam, Martha Lynn, won three races, and proved to be a good producer. Her daughter Vivandiere won the Yorkshire Oaks, and another daughter, Vaultress, won the Park Hill Stakes. Two other daughters produced classic winning daughters in England and France. VOLTIGEUR was the best of his generation in England on the turf, and in the stud continued the sire line through his son Vedette, and also had an influence on breeding in America through his son Billet. He was purchased as a two year old by the second Earl of Zetland, and ran once at that age, winning the Bright Stakes at Richmond. He won the Derby, the St. Leger, after a dead-heat with Pitsford, and, a day later, Scarborough Handicap. The day after the Scarborough Handicap, he beat the more heavily weighted The Flying Dutchman in the Doncaster Cup. In a celebrated match between Voltigeur and The Flying Dutchman in May of 1851, the Dutchman won by a length. Voltigeur went on to run in five more races that season and the next, winning once, The Flying Dutchman Handicap at York. In the stud, he got a number of good staying sons, among them Ascot Gold Cup winners Buckstone and Skirmisher; Doncaster Cup winner Sabreur, and The Ranger, who won the Grand Prix de Paris. His son, Vedette won the 2,000 Guineas and the Doncaster Cup twice. Vedette went on to sire Goodwood Cup winner Speculum, a leading sire in Britain in 1878, and Derby winner Galopin, who was leading sire three times in the late 19th century; Galopin's best son was St. Simon, a great racehorse and the most influential sire at the end of the century in Great Britain. Voltigeur also sired Billet, who became a leading sire in the U.S., and one of Voltigeur's daughters, Woodcraft, produced Derby winner Kingcraft. Some of Voltaire's daughters also were good runners. His daughter MEROPE (1841, from a mare by Juniper, Family 3 - i) was half sister to Malek, Moss Rose and Velocipede (all by Blacklock); she ran second to Sorella in the 1,000 Guineas, and second to Princess in the Oaks, among a number of her placings. She became the second dam of 2,000 Guineas winner Moslem (1865), and through her daughter Flying Duchess, second dam of Vex (winner of the Stewards' Cup) and of Derby winner Galopin, the sire of St. Simon. Voltaire's daughter SEMISERIA (1840, out of Comedy by Comus), won the Derby Handicap at Liverpool, defeating the great Alice Hawthorn, and won the Easby Stakes at Richmond, beating both The Cure and Nutwith, both in 1843. Another Voltaire daughter, VITULA (1838, from a mare by Lottery), won the Yorkshire Oaks. She later was dam of Nassau Stakes winner Cantine (1856), and tail-female ancestress of such horses as Grand National Steeplechase winner Shifnal (1869) and St. Leger winner Dutch Oven (1879). Another good north country running daughter of Voltaire was YORKSHIRE LADY (1839). Some of Voltaire's good-producing daughters included the in-bred LOLLYPOP (1836, out of Belinda, by Blacklock), who was the dam of Sweetmeat; LADY MARY (1838, from Tramp daughter Lady Moore Carew), who was the dam of Atherstone; SACRIFICE (1847, from Virginia by Voltaire's old rival, Rowton, Family 4 - l), dam of the stakes winner Alcestis (1860) who was second dam of Thebais (1878, Oaks, 1,000 Guineas and Doncaster Cup), St. Marguerite (1879, 1,000 Guineas), Clairvaux (1880, July Cup), and Heliose (1884, Coronation Stakes), all of whom were by Hermit. The great sire and dual Prix de l'Arc de Triomphe winner Ribot descends from Sacrifice. 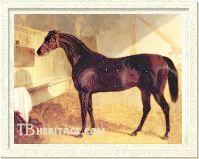 Another Voltaire daughter, VOLLEY (1845, from Martha Lynn by Mulatto), a sister to Voltigeur, was the dam of The Slave (1852, by Melbourne), who produced Stewards' Cup winner Lady Clifden and St. Leger winner Lord Clifden. Voltaire's daughter VALENTINE (1833) was the dam of Doncaster Cup winner War Eagle (1844, by Lanercost).